The Secure Messenger API enables you to offer your customers a messaging channel integrated into your website or app. This chat solution enables secure communication between your agent/bot desktop and client website/mobile app. 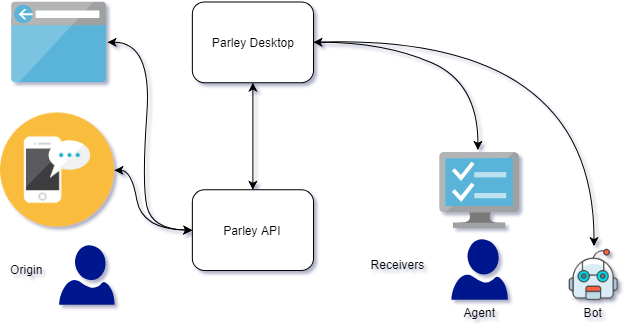 Devices displaying a webpage or app start communication to the company endpoint, where agents on desktop clients or a bot can respond on the customers message. Messages can contain text or images. A bidirectional communication channel between the user and an agent of a service where one can exchange messages. A person that is working in a service center or contact center to answer your questions. A unique identifier for every device. Provide this value in the UniqueAppDeviceID header key of each request. The minimum length for the DeviceID is 10 characters. Secure messaging channel between agent and client. Website or mobile app are supported as clients. Messages can include text or image. StartTyping and stopTyping events can be used to indicate user activity. Paging of message history is supported. An image attached to a message cannot exceed the size of 10 MB. A POST 'Messages' request can include text or an image, but not both in the same request. Make sure you have a registered account on the API Store and created an application on the portal, to receive the associated client ID and secret. These are neccessary to request an access token. You will receive these after your app is approved on te API Store. For accessing and/or manipulating the resources, the client application (your application) needs to be granted permission to do so. The OAuth 2.0 standard defines a protocol that allows such third-party authorization through the use of access tokens. Access tokens are central in the protocol: those tokens, in the form of strings, are delivered by an authorization server (our authentication server) and they enable the client application to securely access protected data on behalf of the resource owner (the end-user). We use Client Credentials Grant which means the application makes the request to the authentication service by sending authorization credentials and the service responds with an access token among other useful information. Copy your app's credentials and replace APP_CONSUMER_KEY and APP_CONSUMER_SECRET with the copied values, then execute below curl command to receive access token. Note: If you are using curl for Windows then please use below command. curl -X POST "https://api-prd.kpn.com/oauth/client_credential/accesstoken?grant_type=client_credentials" -H "content-type: application/x-www-form-urlencoded" -d "client_id=APP_CONSUMER_KEY&client_secret=APP_CONSUMER_SECRET"
The authorization service returns a JSON message that contains the access token field. To sign the API request, use the access_token from the last step and add it to the HTTP header. Also for each request you need to provide the UniqueAppDeviceID key. This is a unique identifier that you have to create for each device. The identifier has a minimum length of 10 characters. You need to subscribe the device before you can send and get messages. When you do not subscribe, we can't tell who you are, so this is important. When you subscribe you will also want to setup the pushToken and pushType of your device to receive updates when a new event or message is available for this device. Edit the parameters by filling out the unqiueAppDeviceId. For receiving messages also fill out the pushToken, pushType and type parameters. Please refer to the swagger-file for more detail. Check the response code and message. Fill out uniqueAppDeviceId in the Headers section. Request the configuration for the identified account. This contains settings and display settings of the account. All colors are RGB colors saved in hexadecimals. Edit the parameters by filling out the unqiueAppDeviceId. Fire the startTyping event to indicate that the user is typing something. To be used and triggered in your app or website. Fires the stopTyping event to indicate user is not typing anymore. To be used and triggered in your app or website. Post a message to the API where the 'sender' is a particular user. Important: You can choose to send a text message or an message with an image. For the textual message you send a 'regular' POST request with the parameters described in 'Query parameters'. To send an image in a message you need to send a POST as multipart/form-data with the attributes from 'Request Body schema'. Edit the parameters by filling out the unqiueAppDeviceId and message. Fill out message in the Body section. (or use '''image''' to upload a file). "message": "Hello, I have a question." Get the latest 50 messages from and to a particular user. The order is by time and descending (from new to old). Retrieve a specific message by the message ID. Edit the parameters by filling out the unqiueAppDeviceId and id. Fill out uniqueAppDeviceId in the Headers section and id in the URL. Retrieve messages by a paginator, defined as "before:messageID" or "after:messagedID". Edit the parameters by filling out the unqiueAppDeviceId, paging and id. Select (GET) Latest Messages using paging. Fill out uniqueAppDeviceId in the Headers section. Also fill out paging and id in the URL.